Sure, I don’t own a car, so my opinion might not mean much. But with every road in the city looking much like the surface of the Moon, traffic is moving a lot slower. The potholes are a kind of traffic calming device. I can step off the curb onto Dean Street and not get run down by someone doing 70mph to (not) make it through the yellow light. Oh just wait until someone doesn’t see that pothole and you get a nice drenching in cesspooled pothole water. Although I do love when a pothole is deep enough that you can see the underlying brick of the former road surface on some streets. Oh that has already happened plenty. With the weather the last week, I’ve been basically soaked to the bone anyway. The traffic on streets like Dean Street moving at under highway speeds outweighs the filthy water splash. There’s a giant pothole in LaSalle Square that has been slowing the LaSalle Speedway traffic too (that was filled this morning though I think). I haven’t gone to check on this yet, but there was a spot at Broadway and Vinton where they tore the street up a couple weeks ago to do some sort of work underneath. The biblical apocalypse descended on us before they filled it, so all the dirt washed out, and there’s now a foot deep, 10 foot wide hole in Broadway at that corner. I hope they fill that soon, someone’s going to gut their car on it. I’m far too lazy to walk the whatever it is handful of blocks to check it out. And on Knight street there’s no pothole but the section near Swiss St. always floods out. If you’re walking you pay attention to oncoming cars. Luckily it’s one way over there from Atwells toward Broadway. The potholes are so big and deep that the other day i hit one and i swear i could hear someone talking in Chinese. 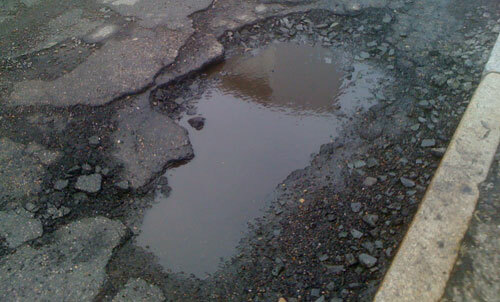 Sure the city staff should know about every pothole, because they are omniscient, right? So try reporting them and see what happens, then you can complain if nothing happens. Today, I reported 155 Power St., since I had to swerve around it. And also asked for the repaving of all of 9th St., since there are just so many patches there already. We’ll see. I wonder if I can report the intersection of the 10/6 exit ramp and Westminster St. There’s like 5737624382347 potholes right there.